SEATTLE (BUSINESS WIRE) Sep. 3, 2013 (NASDAQ:AMZN) Amazon today introduced Kindle MatchBook, a new benefit that gives customers the option to buy—for $2.99, $1.99, $0.99, or free—the Kindle edition of print books they have purchased new from Amazon. Print purchases all the way back to 1995—when Amazon first opened its online bookstore—will qualify once a publisher enrolls a title in Kindle MatchBook. Kindle Matchbook launches in October. On a related note starting Sept.15, all paperback purchases through the Dreamspinner Press website will include a free download of the ebook, and yes, it is retroactive. If you purchased a book directly through Dreamspinner, the ebook will be on your bookshelf and available for download by the end of next week. I’ll post more about that next week. Imagine! 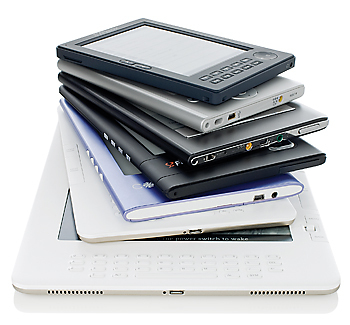 Your entire library of favorite titles on one small device you can carry anywhere. You probably have some favorite authors. For those books, purchasing the paperback upfront would be low risk. You would still have the immediate gratification of the ebook, and the paperback would be on its way.